Carrots are one of the ten most economically important vegetable crops in the world. Besides being a tasty and edible root veggie, the carrots have medicinal usage. Eating carrots on a regular basis helps to prevent gastric ulcers, regulate high blood pressure and diabetes as well as detoxify the overall system. 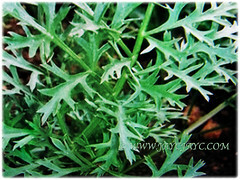 Botanical Name: Daucus carota (syn. 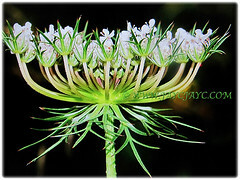 : Daucus carota var. sativus). Common Names: Carrot, Wild Carrot, Queen Anne’s Lace. Origin: Native to Europe and southwestern Asia. Plant type: A herbaceous and biennial shrub. 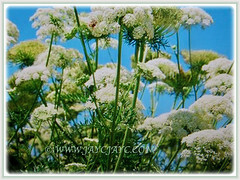 Features: Daucus carota is from the genus, Daucus that comprises of about 20 species of plants. Carrot is a biennial plant that can reach 1 m tall. It is an underground root vegetable, usually orange in colour though purple, black, red, white and yellow cultivar exist. 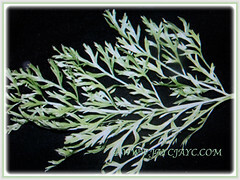 At first, it grows a rosette of leaves while building up the enlarged taproot. Its taproot is thickened, fleshy, straight, conical to cylindrical in shape. The evergreen and green leaves, 8-12, growing in a rosette with long petiole, leaf blade 2-3 pinnate, the segments divided into often linear ultimate lobe. It produces tiny white flowers. The flowering stalks few to several are branched, each branch ending in a compound umbel. Each umbel comprising 50 or more umbellets, each of which has up to 50 flowers. Flowers mainly bisexual in primary umbels, in umbels of higher order an increasing number of male flowers may occur in addition to bisexual flowers. Eventually, the flowers will be followed by fruits that are oblong-ovoid schizocarps, 2-4 mm long, at maturity splitting into 2 mericarps, primary ridges ciliate and secondary ridges with hooked spines. 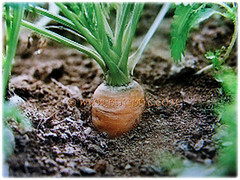 Carrots grow below ground but they also put out a green top that will flower and produce seeds like any other plant. 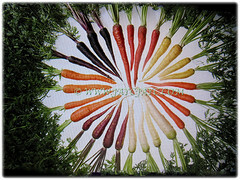 Culture (Care): Daucus carota or Carrots grows easily with the least maintenance. Light: Full sun for best production but carrots can tolerate semi-shade. Moisture: Medium water requirement. Water regularly as they will go dormant and may even lose their leaves during excessive droughts or hot weather. Soil: Moist and well-drained soils. Others: Feed weekly with a foliar spray. As the shoulders of the carrots begin to emerge from the soil, mound a little mulch or dirt around the exposed root to prevent greening. To harvest carrots, pull the roots up by their tops. 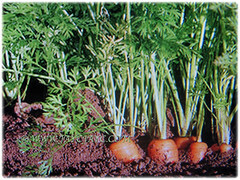 Be gentle when uprooting carrots as some deep rooted varieties may snap when harvested. Generally free from serious garden pests and diseases. However, watch out for carrot rust fly, carrot weevil, cutworm, flea beetle, slugs, leaf blight and soft rot. For subtropical and temperate regions: Hardiness: USDA Zone 3-9. Daucus carota or Carrots are quite cold hardy and even seedlings can tolerate moderate frosts. In fact, its flavour is enhanced by frost. Mature carrots can be left in the ground over winter. Protect with mulch during severe freezes. Start sowing this cool-weather crop 3 weeks before the last expected frost. In Zone 8 and warmer, plant carrots in fall or winter. To save harvested carrots for winter use, prepare them by twisting off the tops and removing excess soil but don’t wash them. Propagation: Easily propagated from seeds that will germinate in a week or more. 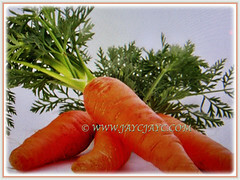 Usage: Daucus carota or Carrots are one of the ten most economically important vegetable crops in the world. Carrots are very tasty when served in soups, juice or salads and are also very rich in beta carotene that are widely used in many cuisines. 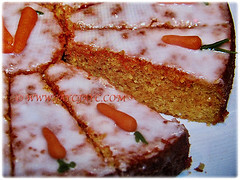 It is great when added to carrot cakes. Its roots contain high quantities of alpha- and beta-carotene and are a good source of vitamin K and vitamin B6. The roots are consumed raw or cooked, alone or in combination with other vegetable as an ingredient of soups sauces and in dietary compositions. Young leaves are edible as a leaf vegetable but are rarely eaten by humans. It has medicinal properties. Carrots are rich in carotenes, some compounds that the liver transforms into vitamin A, which guarantees the good health of the vision by forming a purple pigment that the eye needs in order to be able to see in dim light. Thus people who suffer from night blindness would benefit from the use of carrots on a regular basis. Carrots can also be used externally to cure skin problems such as eczema, wounds, burns or sunburns. Others medicinal uses include tonsillitis, colitis, appendicitis, anemia, gravel, blood poisoning, ulcers, rheumatism, indigestion, poor teeth, acne, cancer, etc. Eating carrots on a regular basis helps to prevent gastric ulcers, regulate high blood pressure and diabetes, and detoxify the overall system. 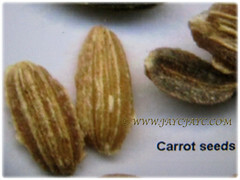 Carrot seeds can be processed into essential oil with tremendous health benefits such as regulating obstructed menses, eliminating intestinal worms, helping to cure cancer of the stomach, mouth, prostate and kidney, stimulating secretion of hormones and enzymes, curing infections and retaining a youthful skin. Just one caution is that pregnant women should not use carrot seed essential oil. It is ideal for container planting and economic garden.